It’s in a retail business’ best interest to develop an omnichannel strategy; customers who engage in multiple channels spend up to 30% more than single channel customers and tend to be powerful advocates for the business. Building these strategies is a process that businesses embark upon, and that process can be made easier through MuleSoft's approach to enterprise integration, API-led connectivity. 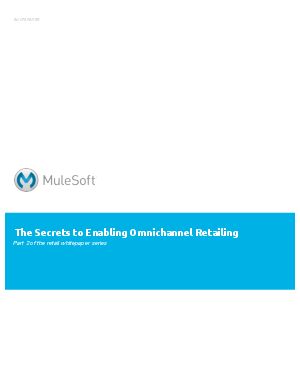 In this whitepaper, we’ll discuss the omnichannel journey and how integrating and exposing valuable data can put retailers in a competitive position to win over the tech savvy customer.